This is a plum of a dish. Simple and relatively foolproof, yet hugely flavoursome and if presented a little better than I did, quite impressive on the plate. The star of the dish is beef short rib. 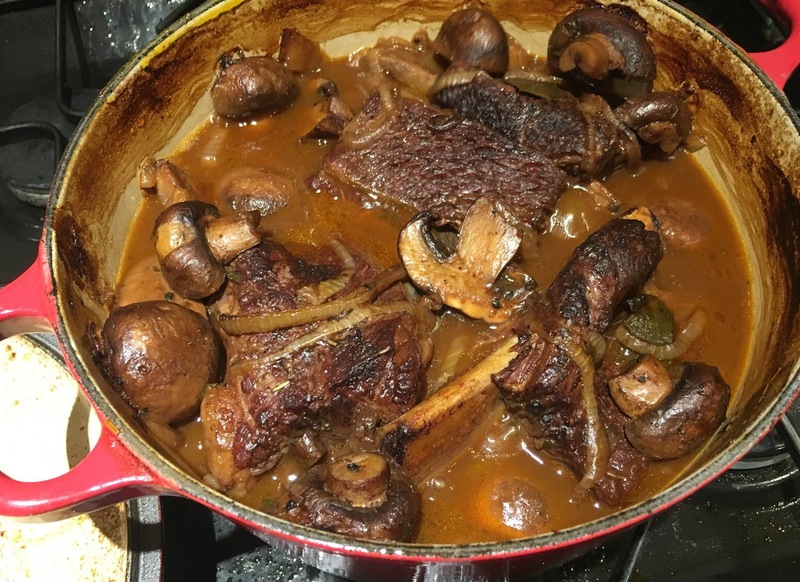 A great hunking, marbled piece of brisket-like meat strapped to gravy-friendly beef bones that add a great smack of umami to the finish dish - something boosted even further by the tomato puree and chestnut mushrooms in the recipe. I got my short-ribs from Waitrose, but before you wince at the thought of Waitrose meat prices, four large short ribs cost me around a tenner and will feed four people. Great value and probably even cheaper from your local butcher. On a rainy summer night of the sort we've become accustomed to recently I like to have this with a big pile of buttered savoy cabbage and a few chunks of good baguette, but come colder months I'd be reaching for the velvety mashed potatoes. Of course this dish is a beery riff on that classic french brasserie dish of boeuf bourguignon, but make sure you opt for a beer that lends itself to the long slow cooking and balanced flavours. Something malty, with a hint of sweetness and little in the way of hops is best. I like a baby-barleywine like Fullers 1845 or Scotch Ale such as Oskar Blues Old Chub, but anything browny-red, sweet and malty will work. For me, porters and stouts have no place in this dish as it will come out more steak and ale pie than Bourguignon. But hey, if you're cooking, use what you like! Start by coating the bottom of a heavy (ideally cast iron) casserole dish with olive oil, adding a large knob of butter and heating on medium-high until the butter foams but doesnt brown. Once the butter foams immediately add two of the short-ribs and brown well on all sides, making sure the butter doesn't go too dark. Remove the short-ribs to a plate and repeat with the final two. Once browned, remove to the plate with the first two. Next add the chopped onion and cook on a slightly lower heat until they start to caramelise (5 mins), then add the tomato puree and mushrooms and cook for a few more minutes, before sprinkling in the flour and stirring until well coated. Next add the beer, stock, garlic, herbs, and short ribs along with any resting juices - before seasoning well with salt and pepper. The meat should be just covered by liquid so feel free to add a little extra stock or water if necessary. Place in a pre-heated oven at 160*C and cook for three and a half to four hours. I usually check after about two hours and if it's looking dry I add a touch more water or stock. On top of that initial cooking time I like to give it a final half an hour with the lid off to thicken up the sauce, with the added benefit being the mushrooms and beef will taste even better if they've had an edge being licked by dry heat. If after this final half an hour the sauce is still a little thin for your tastes then remove the meat to a warm plate and reduce the sauce a little on the hob (but don't over thicken the sauce, this isn't steak and kidney pudding). Season to taste after you've done your reducing to avoid the risk of over-seasoning the sauce. The big, bulky, slightly gelatinous beef ribs are rich and filling so I like to serve them simply with buttered, peppered savoy cabbage and a bowl of sliced baguette for mopping up the sauce at the end, but if your guests are extra hungry then creamy mash is a winner too. In terms of beer matching keep things simple and opt for a glass of the same beer you used during cooking - you can't really go wrong. A delicious, simple, umami-bomb that I guarantee you'll make over and over again. You may have noticed I've had a bit of a break from blogging recently, in fact, my last post was the very end of last year. Not really as a result of any grand decision or great falling out of love with the medium, just for that most uninteresting reason - lack of time, or should I say perceived lack of it. Those of you who know me well will know I now work for SIBA, the Society of Independent Brewers, a fantastic job all told and something I'm hugely enjoying. With that comes welcome and whole-hearted comitment though and as such, I've been rather busy. I hope to be posting on here more regularly, particularly as I've given the page a little spruce up and a more modern, minimal design.